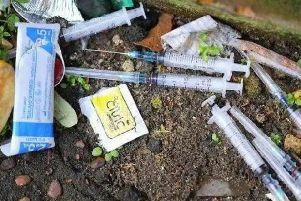 The new Police and Crime Commissioner has put tackling drugs misuse at the top of his agenda for Peterborough, with Central Ward a particular area of concern. Conservative Jason Ablewhite, who is in charge of policing priorities for the whole of the county, wants to clampdown on drugs being brought into the city. The former executive leader of Huntingdonshire District Council, who has now stepped down from that role, was elected in May to succeed Sir Graham Bright as Cambridgeshire Police and Crime Commissioner. And Mr Ablewhite, who has promised to be more visible than his predecessor, wants to stop drug dealers from coming into Peterborough. Speaking during a visit to Cathedral Square today (Thursday, May 19) he said: “There are a lot of specific issues around some of the Central Ward areas. We’ve got many of the sort of drug misuse issues especially that need to be tackled. “I pick out Central Ward, but in Peterborough as a whole it’s one of those areas - because it’s a big, complex city - you’re always going to have more crime than in perhaps some of our more leafier areas of the county. Asked if it is to be a more hardline approach against drugs, he said: “I think it will. I don’t go with this soft approach where things like cannabis should be legalised. I’ve never agreed with that. Soft drugs lead to hard drugs. The law is the law and we must enforce it. “Ultimately, what we’ve got to tackle is the drugs coming into the city and where they’re coming from and how we actually deal with that. “They’ve been some specific targeted campaigns which have born fruit. We have to make sure we keep that pressure up. “We know, frankly, we do get issues from places like London. Drug dealers coming up from places like that. So it’s tackling those people, catching them, working with partners like the Metropolitan Police, collaboration, and making sure we bring those to justice that would do that to our local area. “Possession’s one thing, but if you cut out the source it becomes much more difficult. And that’s where we’ve got to put the emphasis. On drugs in Central Ward, he said: “I’ve certainly had reports of that from local councillors within that area. Certainly when we were campaigning they feel there are significant issues around drug misuse. “Statistically, I have to look at that, but it comes back to having a very large city like Peterborough where you’re always going to have that extra level of criminality because of the nature of the area.